Bed sores occur in patients that have been bedridden and not been properly repositioned for a period of time. These patients would typically be, over 70 years of age, bedridden, or living in a long-term care facility. Bed sores are also known as 'pressure sores' or 'pressure ulcers'. Bed sores are a result of prolonged periods of circulation being cut off however, bed sores can also be caused due to repeated incidents where a sufficient amount of time was not given for recovery. Consequently, bones located near the surface of the skin end up dying off due to cut off of blood circulation. The type of objects that could cut off circulation to these tissues is: a mattress, a chair, a wheelchair, or even other parts of the body (i.e. crossing ones legs can cut off blood circulation). People are in greater risk of bed sores when they cannot move on their own. This is troublesome for hospital staff because they have to be on constant alert for bed sores and make sure that when patients are moved, they are repositioned properly. Bed sores usually start to develop if the patient is sitting or lying down for more than 2 hours in the same position. Poor diet and dehydration will increase the chances of a patient obtaining bed sores because it weakens the strength of their skin. Untreated bedsores can lead to cellulitis or a chronic infection. When infections develop inside the sores, antibiotics are given to the patient. 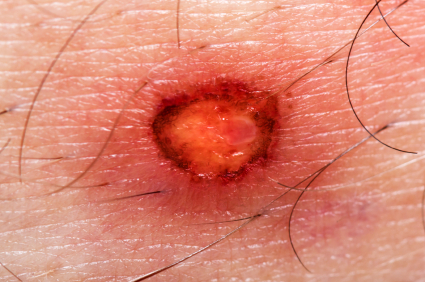 There are four different stages of bed sores. Identifying which stage a patient has progressed too, can help doctors determine how severe the bed sores are and whether it is reversible. In stage one, unnatural redness will occur on the skin, however this stage is reversible. In stage two, the unnatural redness will progress towards an abrasion; this stage is also reversible. Unlike stage one and two, stage three could possibly be life-threatening. A big sore will start forming beneath the layer of skin and start to expand as time goes on. In stage four, extensive damage would have resulted on the muscles and bones which by now, would be fatal. The purpose of treatment is to relieve the pressure inflicted on the sores to allow the healing process to commence. In early stages of bed sores, pressure can be relieved from the sores using a film dressing, which protects the early sores and reduces the amount of time needed for healing. Another treatment used in the early stages of bed sores is, the removal of dead tissue around the sore. Doctors will use a scalpel to extract the dead tissue surrounding the sore. This procedure is painless as the tissue is already dead. The only possibility of pain occurring is during the removal of dead tissue which is surrounded by healthy tissue.